Are all RJ45 to USB adapters the same? Sleek, modern devices don't offer the traditional RJ45 socket for network connection. Instead a USB adapter is the way forward. But what performance do they really offer, and are all adapters the same? Our engineers put two to the test. 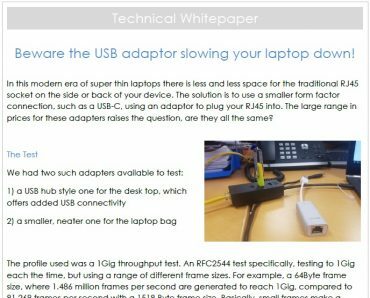 Download this whitepaper to read the results and ensure you are fully aware of the potentials pitfalls of using a USB adapter for your RJ45 connection.